Thank you all for a most successful Mohawk Towpath Byway Duathlon! Some 110 competitors started a 2 mile run followed by a 17 mile biking leg and another 2 mile run to finish. I am no economist but this event brought in over $11,000 which was all spent locally [except $285 of Sanction and Insurance Fees to a National Governing Body in Colorado]. Every other dollar went to local suppliers, businesses, and contractors here on the Byway, or in the southern Saratoga County area. That doesn’t include what competitors or their families spent for conveniences, gifts and remembrances, and fuel for the trip home. During the week before the Duathlon the hits on the website peaked at four times the traffic we normally see for our Byway websites. The calls to our cell phone based self-guided tour were overshadowed only by the number of calls over the first week of July when we were running spots on local public radio. No matter how you slice or dice the numbers your help with the Duathlon pays us back many times over. It reaches a demographic whom we don’t see any other time of the year, at least not in these numbers. Whether you helped with circulating Byway information, stuffed envelops, helped with registration, volunteered with a traffic flag, scooped mashed potatoes and dished chicken, followed in the sweep car, passed out water, monitored the radio waves, or any other volunteer job… your contribution to the success of the Duathlon and ultimately to the Byway are very much appreciated! On February 3 the Town of Clifton Park will be hosting a stewardship hike starting from the Ferry Drive entrance to the Vischer Ferry Nature & Historic Preserve. This walk led by Jennifer Viggiani often attracts botanists, natural history buffs, birders and other interesting naturalists who share their enthusiasm and their perspectives of what we see on the hikes. This is an excellent opportunity to identify recreational and stewardship needs of the Preserve and get some idea about how wildlife is surviving the winter. Dress accordingly and bring boots, snowshoes, crampons, cross country skis or whatever improves your winter mobility. Don’t forget the camera! the Waterford Canal Society explores the current and old Erie Canal features in the Town of Waterford. Let’s work together to establish and annual schedule of these activities and have a calendar of events available to our local residents as well as our Byway visitors. This type of opportunity is what makes a visit to the Mohawk Towpath Byway a memorable experience. I hope to see you on February 3 at 1 PM overlooking the Mohawk River at the end of Ferry Drive. 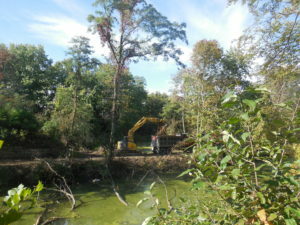 Construction continues on the Towpath Trail. Clearing a grubbing of the entire length (shown above in red) will be completed shortly. The contractor is trying to move a barge into Weger’s Pond outlet on which a pile driver can be mounted. The piles are necessary as a foundation for the 140 foot bridge across the outlet. The bridge will arrive in 20 foot sections. The fabricated bridge will be lifted in place by two “small” cranes at either end of the trail. This view at left was taken from atop the farmer’s bridge abutment to the east of Clutes Dry Dock. You can see that the trail is wide enough for a good size excavator as well as the construction sized dump truck. The truck backed over a half mile into the woods to get a load of debris. This week the Preserve is closed to all but duck hunters, so work on the eastern Halfmoon end of the trail will be the focus. Work on the 10 foot wide stone dust trail is expected to be complete by the end of the year. Its is truly exciting to see the progress. This will be a wonderful recreational recourse for the Byway corridor.